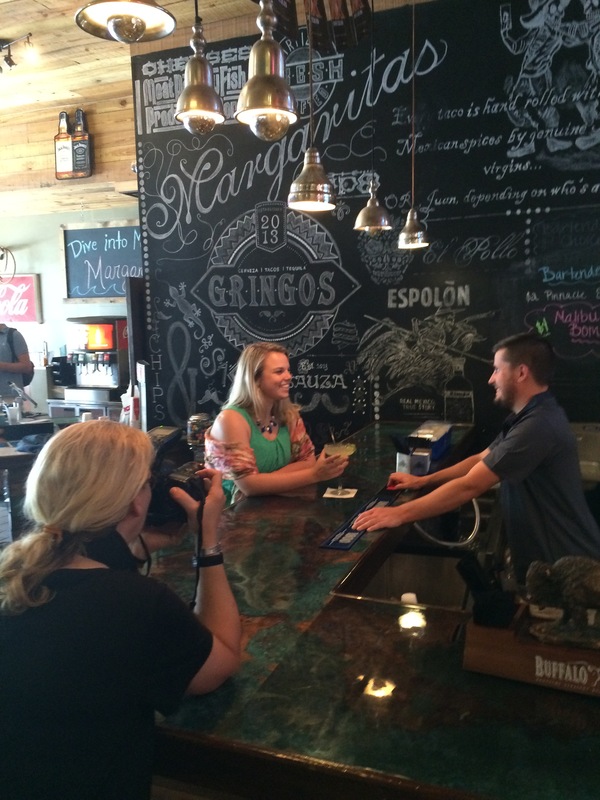 From espresso to tequila to the professional Nikon, the Milledgeville CVB team had the opportunity to go out and about in downtown Milledgeville and take some beautiful photography shots! While the photos won’t be ready for a little bit, here is a sneak peak of what’s to come and some laughable behind the scene moments throughout the day. These photos of Milledgeville’s hot spots will be added to the CVB library to use in promoting visitors to come to our town via a new website coming this fall, social media, and print and online advertising. 10:00 AM- We were all looking a little sleepy on this cloudy morning at our call time at 10:00 AM, but there was excitement in the air. ‘Milly’, the CVB Trolley had a full crowd waiting! The CVB offers trolley tours Monday-Friday starting at 10:00 AM and Saturday’s at 11:00 AM. Jackson Sinclair, our newest mascot, was greeting all of our new Milledgeville guests with a wagging tail, and after snapping a few photos of everyone getting on the trolley, we were off! Crossing our fingers that the rain held off, we set off into downtown Milledgeville. 11:00 AM- Our first stop of the morning was at a favorite coffee shop in downtown Milledgeville, Blackbird Coffee. Chris and Olivia, our two friendly baristas this morning, were keeping the java flowing as we started setting up this cozy space. While most of the students have gone home for the summer, we were lucky to get a couple pictures of people studying, reading and working on their computers. We ran into two businessmen from Macon outside of Blackbird and had them pose for a few photos for us too. They were so well-dressed and looking sharp, we couldn’t resist! After that, we met up with two local Milledgevillains and they looked stunning! We posed them with yummy lattes and told some jokes to have them crack a smile or two. 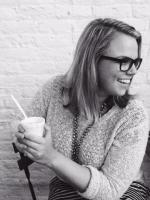 After a little caffeine break, we were off to our next stop: The Market Collective! 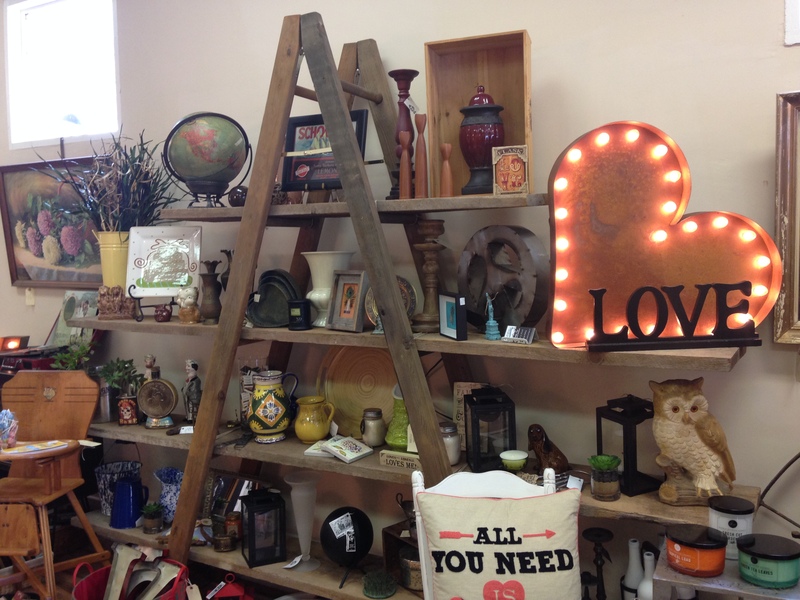 12:00 PM- The Market Collective is a quaint, antique shop located on N. Wayne St. in downtown Milledgeville. While everything in the store is available for purchase, you can also rent anything in the store for weddings, baby showers, parties, etc. Our very own executive director even decided to rent a few items while we were shooting here! We invited a retired couple to join us here and take some awesome shots around the shop. Posing with chalkboards and old marquee signs, we set up some great photos for our upcoming advertisements. 1:00 PM- Lunch time! Our favorite part of the day. We strolled over to the Local Yolkal for a little lunch and conversation. 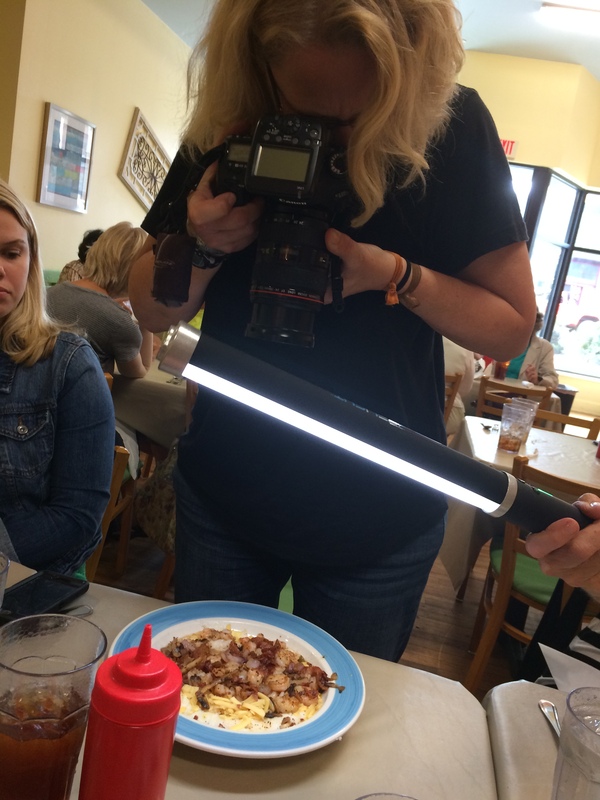 Dining with photographers isn’t easy, and we had to take pictures of everyone’s meals before we dug in! Turkey reuben’s, chicken philly’s, cobb salads and about four pounds of sweet potato fries went from our plates to our mouths in about ten minutes. Can you blame us? Modeling is hard work! With belly’s full and spirit’s high, we headed over to our favorite Taqueira on the block, Gringo’s! 1:30 PM- We caught up with a couple college students and had them pose all around the restaurant. With tables piled up with margaritas, tacos and tortilla chips, we were in taqueria heaven! Behind the scenes was a little chaotic, with customers coming in and the phone ringing off the hook. That’s how you know the food is yummy! Our two models, Megan and Robert, kept their cool though and even made eating tacos look good. Trust us, that is not an easy feat. 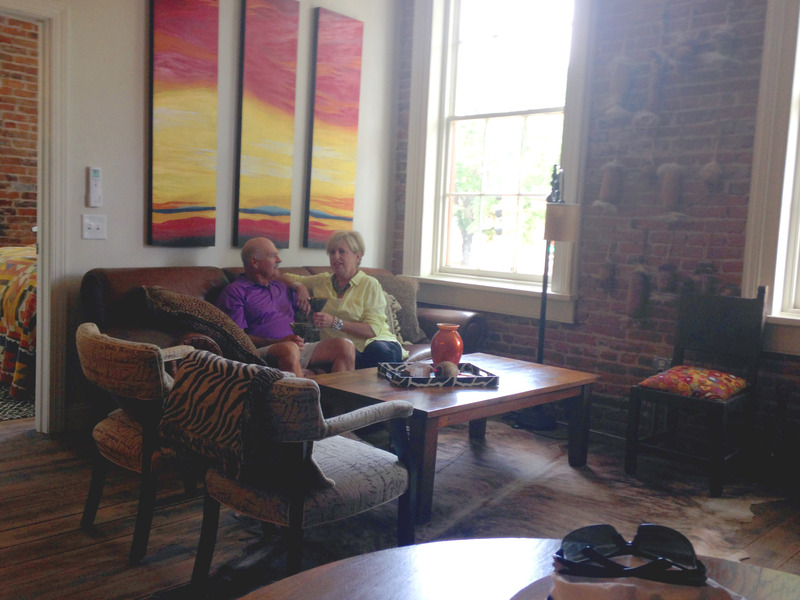 With visions of fried fish tacos and strawberry margaritas dancing in our heads, we said “Adios!” to Gringo’s and headed over to the Soho Lofts, Milledgeville’s newest accommodation. 2:30 PM- We tried not to dive into these giant, comfy beds when we walked into each Soho Loft! Located above downtown Milledgeville (for those perfect Instagram photos) the Soho Lofts include four fully furnished 1 bedrooom/1 bathroom extended stay lofts. They all also include a full kitchen and living room, so you can feel like you’re right at home! We had our models pose in front of the giant windows in the Africa-themed room, which includes paintings of the African Savanna and animal prints galore. The brick walls give each room a rustic feel, and the antique décor and furniture is so inviting. You’ll want to move into each of these rooms as soon as your step foot into them! 3:00 PM- All of this modeling and running around had us craving a sweet treat, and lucky for us we have a brand new ice-cream shop downtown called SweeTreats! Offering ice-cream, frozen yogurt, a plethora of mix-ins and to die for pound cakes, cookies and cupcakes, we would be lying if we said we didn’t drool a little bit when we stepped inside. The smell of sugar mixed with chocolate, lemon and vanilla hits you as soon as you walk in the door. It’s a tiny little store with a HUGE yum factor! No lack of models here, as this place stays packed with families, couples, students, locals, and people of all ages! And let’s just say that the idea of a child dressed cute, calmly sitting and smiling while licking a dripping, strawberry ice cream cone is more beautiful in theory than actuality! 4:00 PM- Our final stop of the shoot was no kids allowed! We swung by the swanky, sophisticated Aubri Lanes and kicked happy hour off the right way! With beautiful paintings, a sweeping staircase and a unique wine cellar in the back of the restaurant, you’ll want to celebrate here any night of the week. Did you know that Aubri Lanes used to be a bank? That’s why they have a giant safe turned wine cellar. A lucky couple can even dine in the wine cellar during the week; just make sure to make a reservation! We took some shots of friends’s catching up over martinis and wine, and were jealous of how much fun they were having! Aubri Lanes was a great way to end this amazing day of showing off our beautiful city, and we can‘t wait to see how the shots came out! Thank you to the Bright Ideas Group in Macon, we cannot wait to see what we inspired.